What Happens to PRE-2013 Liens That Weren't Activated? - ScanFiles, Inc.
What Happens to PRE-2013 Liens That Weren’t Activated? So, you’ve got hundreds of thousands (or millions) of dollars in workers comp lien claims you filed under Labor Code 4903(b) before January 2013, and you couldn’t raise the cash to pay the Activation Fee before the deadline. Now what? This post reviews the nature of medical and medical-legal expenses and the Claim of Lien under Labor Code Section 4903, and explores post-LAF Deadline options for providers. Readers should take into account the fact that I am not an attorney, do not practice law, and am not providing any sort of legal advice here; I am simply trying to put all this into context so readers can understand the various pieces of this puzzle, and pointing out some interesting arguments that might be used to collect the medical-legal expenses that were once part of a now-extinguished lien claim. … so, medical and medical-legal expenses incurred by the applicant are paid to the providers as part of the applicant’s “compensation“. Normally, we think of the applicant’s “compensation” as being just their permanent disability award at the end of the case. Permanent Disability is found in the same Chapter and Part of the Labor Code as medical and medical-legal expenses (Chapter 2 of Part 2), but PD is under Article 3, “Disability Payments”. Thus, it’s all “compensation” afforded the applicant under the workers compensation system. Assuming the applicant has a right to compensation under the employer’s workers compensation policy, and assuming the expenses were incurred according to all pertinent Labor Codes and Regulations (and published case law), medical providers have a right to payment for their services as defined by Labor Codes 4600-4614.1 and CCR 10451.2. Medical-Legal providers have a right to payment for their services as defined by Labor Codes 4620-4628 and CCR 10451.1. Medical-Legal providers have a very specific and well defined payment and dispute workflow defined in Labor Code 4622 that, if followed accurately and timely, provides authority for the provider to be paid relatively quickly and directly by the employer/carrier through either the IBR process, or through the filing of a Petition For Determination Of Medical-Legal Dispute. 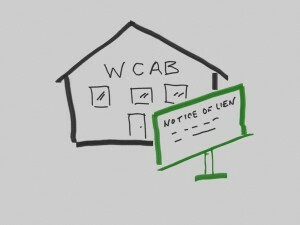 The Petition For Determination process is well defined in the WCAB’s regulation CCR 10451.1 and derived from the specific authority for such a petition as found in LC 4622(c). It’s pretty clear from that regulation (and Labor Code section) that enforcement of unpaid medical-legal expenses does NOT require a LIEN to resolve… at least as long as a lien was never filed. The rest of this article will go into a deeper discussion of what happens when a lien WAS filed, and has since been extinguished. Medical expenses, on the other hand, are more complicated. The Labor Code defines a Utilization Review process and Independent Medical Review (IMR) process that is all about enforcing exactly WHAT procedures and medications may be prescribed by the treater, and an Independent Bill Review (IBR) procedure for resolving billing disputes. For everything else, or for expenses that were accrued prior to the IBR and IMR systems, the WCAB has defined in CCR 10451.2 that enforcement of disputes must be resolved through the Lien Procedures as defined by LC 4903(b), CCR 10770, and 10770.1. Thus, medical expenses present a deeper challenge to collect when a pre-2013 claim of lien has been extinguished due to lack of payment of the LAF fee by the deadline. Most people that are exposed to the term “work comp liens” assume that a provider who holds a lien has a right to be paid out of the injured workers Award for Permanent Disability – i.e., their “cash” award. After all, that’s what having a “lien” against some asset usually means. LC 4903 starts off in the first paragraph with the sentence, “The appeals board may determine, and allow as liens against any sum to be paid as compensation, any amount determined as hereinafter set forth in subdivisions (a) through (i).” (emphasis added). However, based on our discussion earlier about medical and medical-legal expenses, we know that such expenses ARE paid out of a form of “compensation” provided by the employer/carrier to the applicant, but it’s NOT from the applicant’s permanent disability award. Of the NINE categories listed in (a) through (i) of LC 4903, EIGHT of the categories are expenses paid out of the applicant’s permanent disability COMPENSATION, such as the attorney’s fee under (a), or from outside insurers, disability plans and third parties that paid some of the applicant’s expenses during the time the applicant was unable to work. These third party payers listed in (a) through (i) of LC 4903 may file a lien against the applicant’s compensation and be paid back out of the PD Award at the conclusion of the case. These include living expenses that may have been paid by some third party, burial expenses, and unemployment benefits. Of the categories listed in (a) through (i), subsection (b) liens are the only ones NOT paid or reimbursed out of the applicant’s permanent disability compensation at the conclusion of the case. Liens in subsection (b) are paid out of the applicant’s medical and medical-legal compensation. The point I am making here is that a “Claim Of Lien” under LC 4903 notifies the appeals board that some third party (not the applicant or the employer) is requesting their “claim” be paid out of the applicant’s “compensation” derived from the workers compensation benefits. An important concept in this discussion is that a “lien claim” is a separate and distinct right of the provider of services (or any lien claimant) from the expense defined and enforced under other Labor Code Sections. For example, LC 4660-4614.1 defines the rights of a provider of medical treatment services to be paid, and LC 4620-4628 defines the rights of a medical-legal provider to be paid. Most providers collect their fees and costs under those code sections without ever acting on their right to file a lien under LC 4903. For example, consider the “Mechanic’s Lien” in the civil world. A contractor that works on your house and remains unpaid may file a LIEN against your property. If your home is sold while the mechanic’s lien is still in effect then the contractor must be dealt with before the sale of the home can be completed. Usually, the money owed the contractor is taken out of the proceeds of the sale of the property and paid to the contractor holding that lien. LC 4903 Liens in workers compensation are handled in much the same way as the mechanic’s lien. At the conclusion of the applicant’s case against the employer, any liens then on file under LC 4903 MAY be awarded out of the proceeds of the applicant’s compensation by the appeals board in the manner and fashion described in LC 4903 and 4903.1. As I outlined earlier, the subsection (b) liens are a bit of a different animal than the other liens in subsections (a) through (i), but it’s all still the same theory and concept. While all the other categories of liens are awarded out of the applicant’s permanent disability compensation, the medical and medical-legal expenses are paid out of the applicant’s medical and medical-legal “compensation”. The point here is the contractor in the mechanic’s lien scenario owns a receivable which is payable REGARDLESS of the lien claim against the house. The lien claim against the house is merely a legal pathway (process) for the contractor to enforce his rights to be paid by the homeowner for the services that were incurred. The mechanic’s lien is just a way for the contractor to secure that receivable. If the contractor failed to file the lien before the statute of limitations, or failed to pay the filing fee, or in any way failed to execute his right to file a lien against the property, that contractor CONTINUES to be owed the money by the homeowner, and may still ENFORCE and COLLECT that receivable through whatever legal means available. In other words, the LIEN and the RECEIVABLE are not the same thing. This same concept applies to medical and medical-legal expenses in California workers compensation. Medical-legal expenses are defined and described in Labor Codes 4620-4628. The provider is responsible for accruing the expense under the defined procedures, and after properly billing for their services (following any established fee schedules) and serving all the correct parties with an invoice, the provider may be entitled to payment for their services. If the employer/carrier fails to pay the amounts owed for the services there are a series of collection procedures written into LC 4622 that must be followed to ensure and enforce the receivable as a medical-legal expense duly owed on the case. Assuming the provider successfully navigated ALL the various procedures and timelines defined in LC 4622(c), and the receivable remains unpaid1, that provider MAY file a claim of lien under LC 4903(b). The operative word being “may”. Just like in our mechanic’s lien example above, the provider of medical or medical-legal services owns a valid receivable separate and distinct from any claim of lien, and the provider has every right to enforce and be paid for their services regardless of the status of that claim of lien. The reason a medical or medical-legal provider may want to file a lien is because there are specific lien enforcement procedures written into CCR 10770.1 and other related sections that provide a Lien Claimant certain rights to use the appeals board and seek awards for their underlying receivable. Given the fact that the appeals board has exclusive jurisdiction over any disputes regarding that receivable, these “lien procedures” may be the only avenue of legal enforcement available to the provider. However, the vast majority of all medical and medical-legal expenses are paid without the provider ever filing a lien. Some such expenses get paid quickly and without incident once the invoice is served on the employer/carrier. Some get paid paid by going through other enforcement procedures, such as IBR, IMR, or the Petition For Determination Of Medical Legal Dispute under CCR 10451.1. Some such expenses get paid after a LC 4903 lien is filed but without ever making an appearance at the appeals board… and, of course, there ARE some such receivables that ONLY get paid after attending a hearing or trial as a Lien Claimant under CCR 10770.1. The point is, nothing in any code or regulation (that I know of) states that a LC 4903 lien MUST be filed in order to qualify an otherwise valid medical or medical-legal expense as payable. Like the contractor and the Mechanic’s Lien, It’s just one option of enforcement that may be employed by the provider to secure his/her receivable. THAT is a very big point in this whole Lien Activation Fee (LAF) Deadline situation. For all those medical and medical-legal providers out there who had filed a lien prior to 2013, and failed to pay the activation fee on those liens before 1/1/2016, you should’t give up on those receivables just yet. You merely lost the claim of lien, which is not the same as having the receivable extinguished. The PROBLEM providers face when they previously HAD a claim of lien prior to 2013 but that claim has since been extinguished “with prejudice” by operation of law, is that whatever appeals board enforcement rights that existed previously through that claim of lien and CCR 10770.1 have now been permanently lost. You can’t just re-file a new lien. The provider is no longer a Lien Claimant as defined by CCR 10301(t) and has no pathway to become a Lien Claimant on that case again for those same services. That also means the provider can never become a case “party” as defined by CCR 10301(x). Those are significant limitations, depending on what OTHER avenues of enforcement are available to that provider. If the claim of lien was the ONLY legal pathway to get an Award from the appeals board forcing the employer/carrier to pay the medical or medical-legal receivable, then that provider has a pretty serious challenge to get paid. Make no mistake that the receivable is still OWED by the employer/carrier regardless of the status of the lien claim, and the employer/carrier are still fully responsible for payment of that receivable… but the provider lacks a legal right to go before a Judge in some court with jurisdiction and FORCE the employer/carrier to pay that debt. HOW CAN RECEIVABLES BE ENFORCED WITHOUT A LIEN? What we’ve described so far in this post is that a receivable under LC 4600 or 4620 et. seq. is still a valid receivable, payable by the employer/carrier, regardless of the existence of a LC 4903 claim of lien. I see no authority that stands for the underlying receivable becoming extinguished simply because the provider screwed up the claim of lien. The question becomes, HOW TO ENFORCE PAYMENT FROM THE EMPLOYER/CARRIER without going through the established Lien Procedures defined in CCR 10770.1, Labor Code 4903, and related “lien” procedure authority? For medical-legal providers, there is a viable answer in CCR 10451.1, Determination of Medical-Legal Expense Disputes. This clearly states that if a provider never filed a claim of lien under LC 4903(b) then it can enforce collection of the receivable using a Petition For Determination Of Medical Legal Dispute process, without filing a lien, and without paying a lien fee. However, what if the provider already filed a lien? CCR 10451.1(e) is titled, “Medical-Legal Lien Claims Filed prior to January 1, 2013 under Former Labor Code Section 4903(b)”. The brief language in this section states in its entirety: “Medical-legal lien claims filed prior to January 1, 2013 under former Labor Code section 4903(b) shall be subject to the lien conference and lien trial procedures of section 10770.1, subject to the timely payment of a lien activation fee, if applicable.” That’s it… end of subsection. It’s important to note that it states medical-legal “lien claims”, and not medical-legal “expenses”. There again, this statement only applies to the claim of lien, and not the medical-legal claim for services provided. Those are two separate rights. Therefore, if the invoice is for services accrued prior to 2013 but a lien was never filed, then clearly the procedures in CCR 10451.1 would still be available to the provider. So…. if you never filed a lien on your pre-2013 invoices, you should be able to use the Petition For Determination Of Medical-Legal Dispute procedures without filing any liens, or paying any lien fee. CCR 10451.1 doesn’t state what happens if the provider HAD file a lien on their pre-2013 invoice, and that lien has since been subsequently dismissed or extinguished by operation of law. Subsection (e) says the provider is responsible for paying the lien fees, which would include the LAF, but again it also states in subsection (c)(3)(D) very clearly that having a claim of lien is purely optional for medical-legal expenses, and is not required. Therefore, the existence or non-existence of a medical-legal lien claim should not affect the rights of the provider to file a Petition For Determination under CCR 10451.1. In fact, if I were a medical-legal lien holder, I would have seriously considered not paying ANY LAF fees at all, let all those liens be extinguished by operation of law, and simply gone through the CCR 10451.1 route on all my accounts receivable. Nowhere in CCR 10451.1 does it state that a Petition For Determination and the procedures set forth in the section cannot be used when the provider once HAD a claim of lien on file, but has since LOST the rights to that claim. I’m not trying to read something into CCR 10451.1 that isn’t there, I am simply taking the language of the section at face value and saying providers should follow it. Nothing in the section appears to me to stand for “If you screw up and lose your claim of lien then you can’t file a petition for determination and still collect on your receivable.” Logically, from a plain reading of the section, it would appear that liens are OPTIONAL and not necessary in the enforcement of a medical-legal dispute – period. CCR 10451.1 seems to provide all of the same benefits of CCR 10770.1, but with a whole lot less friction and landmines. WILL THE WCAB SUPPORT THIS THEORY? Most of you are probably reading this and thinking “this is an interesting theory, but no Judge is going to stick his neck out and support this interpretation given the present political environment.” That’s probably an accurate response to what I’ve offered up here, but I’m just pointing out what the “black letter of the law” states in these various sections. What it boils down to is will the WCAB support this interpretation upon Petition For Reconsideration? I want to point out that CCR 10451.1 is a WCAB regulation, written by the commissioners now sitting on the WCAB. The commissioners are attorneys and judges that came up through the ranks of this system, and have a fairly even political mix of both the applicant and defense backgrounds. In other words, the people in control of whether this interpretation wins or loses are the best legal minds our system has to offer – and the very people that wrote CCR 10451.1. They will respond to this interpretation of THEIR regulation from a LEGAL standpoint, more so than a political one. As a stark contrast to the position of the WCAB commissioners, the Lien provisions of CCR 10770.1 is a DWC regulation, which was authored by political appointees inside the DIR, many of whom were directly behind the drafting and political wrangling that brought us all the anti-lien provisions of SB 863. When you compare the fairness to the providers in CCR 10451.1 with the frictional and aggressive treatment in CCR 10770.1 you get a distinctly different political flavor. My point here is that injured workers and the medical-legal providers have a fighting chance of NOT getting summarily dismissed for no other reason than they work for the applicant side when dealing with the WCAB. Personally, I think medical-legal providers have a fighting chance at this interpretation of CCR 10451.1 through a WCAB published case. Medical providers don’t have the luxury of a Petition procedure like the medical-legal providers have, so for medical providers that failed to pay the LAF and protect their lien claim, things will be more difficult. To be successful with this vision, the providers should make a concerted effort to engage on this issue as a GROUP, much like the California Applicants Attorneys Association does when they want to get an important interpretation of the law published. Hire the best attorney possible and have him/her represent the best CASE possible in a venue where the appellate courts have the configuration you think have the best possibility for success. DO NOT simply start filing Petitions on every receivable you have, and sending any old lien representative to the Board on these. THAT would end in disaster. This is a sensitive legal matter that will take a delicate and thoughtful approach. I suggest CAAA and CSIMS work on this together, and the medical-legal providers as a whole give the perfect case a year to percolate through the right channels and appear before the WCAB in the best possible light. I believe that the CAAA Board would be more than just open to supporting their valued providers in this area. At least for medical-legal providers, there seems to be a dim but present light at the end of the proverbial tunnel when it comes to enforcing payment on their pre-2013 lien claims that were not “activated” by paying the LAF before the deadline. I certainly would not just give up on those receivables and destroy the files, or in any way stop pursuing the employer/carrier. It may not be worth the money spent on supplies and postage to send a ton of statements or invoices out on those receivables, the money IS still owed. Medical providers need some sort of creative method to get jurisdiction over the employer/carriers, and some sort of class action lawsuit certainly seems in the realm of possibility. I should point out that the CCR 10451.1 Petition procedure is silent on any Statute Of Limitations, so all those old receivables that never had a lien filed certainly seem like a candidate for such a petition to me. Any receivable that was never the subject of a lien seems ripe for a Petition For Determination Of Medical-Legal Dispute unless and until the WCAB comes out with a published case that says otherwise. Providers should proceed very carefully from this point forward. I suggest you come together around CSIMS, CAAA or some other group so that some of you don’t go off in some direction and cause the WCAB you issue a poor case on this matter.